BBa_J61051, NahR with nahR and sal promoters (Pr and Psal), codes for the inducible repressor NahR, which suppresses Psal in the absence of salicylate. This biobrick makes it possible to regulate the expression of the red fluorescent protein dTomato. Figure 1. dTomato expressed in E. coli DH5-alpha. NahR/Psal induction test in LB medium. Concentration of salicylate from left to right: 0,1 μM, 1 μM, 10 μM, 100 μM and 1 mM. Figure 2. dTomato expressed in E. coli DH5-alpha. NahR/Psal induction test on agar plate. Concentration of salicylate from left to right: 0,1 μM, 1 μM, 10 μM, 100 μM and 1 mM. The dTomato protein is a fluorescent protein dimer, created by direct evolution of the wild-type DsRed, from Discosoma sp. (Shaner et al, - Improved monomeric red, orange and yellow fluorescent proteins derived from Discosoma sp. red fluorescent protein, 2004). The dTomato protein is a fluorescent dimer protein that emits orange-red light when it is excited by green-yellow light. It is preferable to use – especially in self-made fluorometry tests – because the excitation wavelengths and the emission wavelengths don't overlap as much as in other fluorescent proteins. 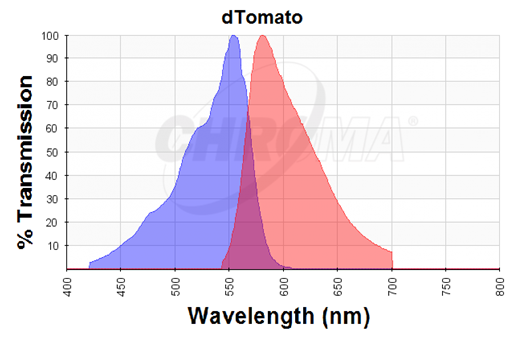 The dTomato excitation peak is at 554 nm and 50% of it is at 510 nm. Also, its emission peak is at 581 nm and its 50% emission at 629 nm (Figure 3). 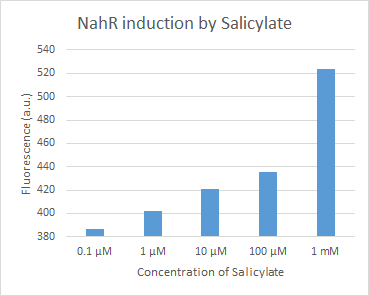 The aim was to prove that salicylate can induce the NahR/Psal promoter and that a higher concentration of salicylate will result in a higher fluoroscent activity. We tested the NahR/Psal promoter system with dTomato on a pSB1C3 plasmid. The cells containing the plasmid were streaked on agar plates with different salicylate concentrations in the agar medium. Similarly, we also examined liquid cultures with different concentrations of salicylate in the solution. Both of these tests showed that the bacteria were producing the dTomato protein in presence of salicylate, independent of the salicylate being in liquid culture or in the solid growth medium. It can also be easily observed that the fluorescence increased with increasing salicylate concentrations (See figure 1 and 2). The measurements were made with the fluorometer that our team built in order to be able to characterize this system. These results were compared to MACS measurements on the same colonies and the measurements were correlated.